Posts covering the Buffalo Bandits and the great sport of lacrosse. About a month ago I chose to run with a new design/theme for the site. The change over led me to abandon the header image I had used previously and adopt the plain blue and white header you see now. But I feel the time has come to put a new header image up so that I can continue to grow my #brand. Or something. So I’m holding a design contest, of sorts, to pick a new site header. The contest is open to literally anyone and everyone and the winning designer will receive a 2ITB Prize Pack (some hats), so you won’t be doing this pro-bono. Well, sort of pro-bono since there won’t be any money involved, but you still get some cool stuff if you win. – The header image must be 1000×200 in size. – The image should incorporate the Sabres, the city of Buffalo and/or the Bills. All three don’t need to be included, but the image should pull on each of these in some way. – The image needs to incorporate “Two in the Box”, because #brand. – Be creative. I’m not adverse to overly unique designs and I’m open to new things. So don’t shy away from an idea because you’re worried I’ll hate it. I will add that I’ve grown to like the clean look of the page with the basic blue header, so I’d be partial to a clean, uncluttered design, but I’m truly open to anything. Feel free to send along any questions you might have along with tagging your entry on Twitter using #2ITBDesign. I’ll be sharing my favorite designs via Twitter as well. Despite a heavy turnover with offensive talent entering the 2012 season, the Buffalo Bandits experienced a relative lull in production and success. The Bandits stumbled to a 7-9 record before a narrow, heartbreaking defeat to Toronto in the first round of the playoffs. After some restructuring in the front office, new general manager, Steve Dietrich, has been busy this summer. In addition to applying the franchise tag to Tracey Kelusky and Anthony Cosmo, Dietrich re-signed John Tavares and pulled the trigger on three significant trades. 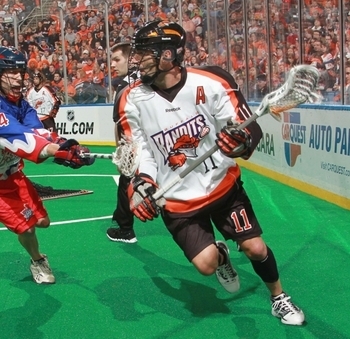 Shawn Williams was the prized acquisitions in a busy summer for the Bandits. The first trade was easily the biggest. The Bandits acquired Shawn Williams, defenseman Brandon Doran, a 2012 first round pick and two 2012 second round picks in exchange for Buffalo’s first round selection in the 2012 draft. The draft is set to take place on October 1.Dietrich also acquired defenseman Glen Bryan and forward Jamie Rooney from the Toronto Rock in exchange for a second-round pick (14th overall) in the 2012 NLL Entry Draft and a fourth-round pick in 2013. His final trade brought in transition player David Brock and forward Mike Hominuck from the Philadelphia Wings in exchange for Kevin Buchanan and a third-round pick in the 2013 NLL Entry Draft. The trade with the Wings signified the end of a short, disappointing stint with Buffalo for Buchanan. A talented forward, he struggled to get free in Darris Kilgour’s system and was never an effective piece of the offense. His inability to tally on outside attempts made him particularly impotent here. Hominuck is a steady offensive player who should fill a similar role as Buchanan on Buffalo’s second offensive unit. According to a Buffalo News report, Darris Kilgour will only be making decisions from behind the bench next season. Budd Bailey reports that Kilgour has been relieved of his duties as general manager, but will remain on as head coach. The report also indicates that Derek Graham will no longer serve in a position with the team. This is a huge decision for the Bandits to make. Kilgour has played a major role in he franchise’s impressive run since the early 2000s. His skills as a coach haven’t wavered much, but it seemed as if the burden of doing both jobs was affecting his success rate. Kilgour stepped down from his duties as GM and coach a couple of season ago, allowing Graham to cover most of the major personnel decisions as the associate GM. However, that seemed like a decision made merely in the title and that Kilgour would certainly remain a major part of the decision making process when it came to drafting, trades and decisions with contracts. This is a step towards giving the Bandits a clean sweep of sorts. Much like the Sabres, fans have begun to wonder if the message with the Bandits had begun to grow stale. Kilgour has been a fixture behind the bench much like Lindy Ruff. While there is little reason to remove one of the greatest coaches in NLL history, Kilgour will be under a bit more scrutiny from those above him. As to who may fill the void in the front office is up for debate. There are plenty of strong lacrosse minds out there who would certainly compliment Kilgour’s hard-line coaching style well. The Buffalo Bandits will be playing the post season thanks to another victory on national television. Buffalo’s 14-9 victory over Rochester was powered by a tremendous effort by Anthony Cosmo in goal and the NLL’s newest Player of the Week, Mark Steenhuis. Steenhuis led all players with eight points (4+4) as he helped clinch a playoff spot for the Bandits. The former Transition Player of the Year (2008) has improved his offensive output in recent weeks and has put him on pace for a strong showing offensively this season. This is of particular importance considering the regression he had over the past two years. The Bandits still have a chance to improve their standing in the NLL’s East Division as the playoffs draw near, but they will be playing on the road in the first round no matter what. Saturday’s game in Washington will be nothing more than a warmup for next week’s first round playoff game. In addition to Steenhuis’ big effort, the Bandits defense locked down and stifled the usually high-octant Knighthawks offense last Saturday. Anthony Cosmo was superb in goal and enjoyed an evening of long, outside shots and only a handful of high-quality chances. He was capable of turning aside most of the Knighthawks’ best chances. Cosmo was part of a larger defensive effort that saw the Bandits hold the Rochester to only two goals in the first half and many long scoreless stretches. That includes a drought of 16 minutes without a goal. From 11:54 of the second quarter until 12:45 of the third quarter and 11:26 of the third to 8:46 of the fourth quarter were the two longest droughts for Rochester. Buffalo made the Knighthawks pay, piecing together a number of lengthy runs, something they have struggled with this season. The Buffalo Bandits enter this weekend’s game with Rochester with a truly unique opportunity in front of them. They can not only clinch a playoff spot, but also lock down the first overall pick in the 2012 NLL Entry Draft. Thus is life in a nine-team league, I suppose. Obviously the Bandits will need some help if they are to achieve this feat. First, the easy part. The Bandits can clinch the playoffs if they beat Washington next weekend at home. Plain and simple, just win your game. However, the Bandits could also clinch with a win tomorrow and a loss by either Washington or Rochester in the next week. The Bandits are currently flirting with missing out on the final playoff spot due to the swing rule that has been instituted this season. If the worst team in the East finished below the worst team in the West, the West team will play in the playoffs. Right now Washington and Buffalo are in a bit of a dog fight. A national audience was able to tune in to catch the most convincing victory of the year for the Buffalo Bandits. The debut of the NLL on CBS Sports Network was a good one of the league and the Bandits. Mark Steenhuis had six points (3+3), Luke Wiles had seven (3+4) and John Tavares had eight (4+4) as Buffalo cruised to a 17-7 victory over Philadelphia. The real story was the near flawless effort the Bandits defense put together. It has been a rough season for the Bandits, defensively. Mike Thompson has had his ups and downs and Anthony Cosmo has struggled to settle in since being acquired via trade. However, things came together last night for Darris Kilgour’s squad. Cosmo was phenomenal for the entire game and the defense, as a unit, kept most of the Wings’ shots well to the outside. There were a number of easy saves that Cosmo made on the night. However, there were plenty of dazzlers as well. That includes a pipe-to-pipe stop in the third quarter that goes down as one of the most impressive saves I’ve seen made on an indoor lacrosse field. The Bandits are hoping the luck of the Irish will help snap them from their current losing streak. For their game against Minnesota on Saturday, March 17, the Bandits will wear special St. Patrick’s Day jerseys. The game-worn black and green jerseys will be auctioned off on Bandits.com, with the auction beginning at 5 p.m. on Monday, March 19 and ending at 9 p.m. on Sunday, March 25. Proceeds will benefit the Juvenile Diabetes Research Foundation. In addition, replica jerseys will be available for purchase in the team store, along with other St. Patty’s Day-themed Bandits items. Futhermore, Bandits forward Luke Wiles will appear on Time Warner Cable Sportsnet’s “The Enforcers” tonight, March 12, at 6:30 p.m. on Channel 13 to discuss the jerseys and the upcoming St. Patrick’s Day game. I like when teams do this sort of thing. It gives you a reason to check out the game and usually the designs are pretty fun. The jerseys look as if they will just be a modified version of their black road uniforms. In place of orange and purple, there will be green. The Bandits.com story has a picture.